If you’ve used Google even remotely over the last few years, you’re aware that the search engine results page (SERP) has gone through some major transformations, mostly to the amount of space taken up by paid ads. With 13 billion searches being conducted within Google on a monthly basis, and 96% of Google’s revenue coming from advertising, it makes sense for them to continue to find new ways to get searchers to click on their ads. Over the last year, the PPC industry has seen some major changes not only within the AdWords platform, but also on webpages themselves. As you can see, the areas surrounded by red are all paid ads and the amount of space they are taking up has increased dramatically. 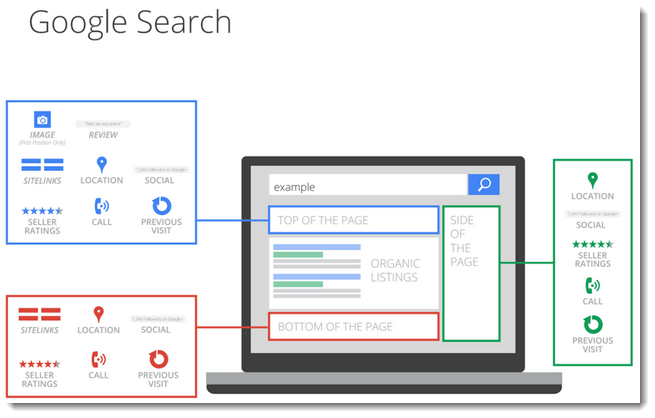 And with the launch of product listing ads and map listings showing up on the right hand side, making sure your text ads are appearing in the top 3 spots is more important than ever. In fact, for searches with high buying intent, 65% of clicks come from paid results. And on average, the top 3 ad spots take up over 40% of clicks throughout the whole page! Once you’ve optimized your PPC account to obtain a satisfactory position, the next step is to increase your clickthrough rate and the amount of space you take up on the screen, otherwise known as “screen estate.” This is where Google add-ons called Ad Extensions come into play. Ad Extensions are a way to give potential customers useful and relevant info beyond a regular text ad. It also increases the amount of space you take up within an ad position. Over the last 2 years, Google has introduced a lot of new extensions and many advertisers aren’t taking advantage of their full potential. Sitelinks, for example (the extra links located below your ad text), have shown to increase clicks by 10-20%. Image Source: "Google's Inside Adwords"
Below is a breakdown of where ad extensions can show up, depending on your ad location, as well as a definition for each. Stream highly recommends adding as many ad extensions to your campaigns as possible, as long as they are relevant to your business. Call Extensions - allows you to add a phone number to your ad, making it easy for customers to call you directly. 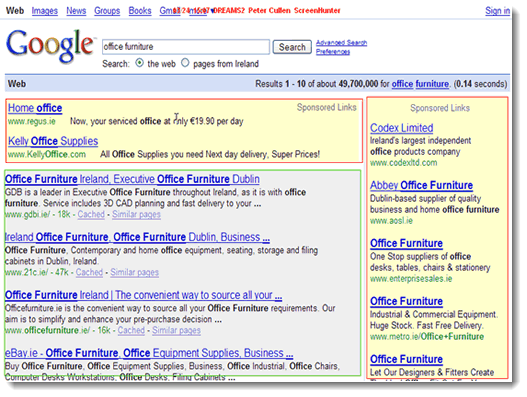 Call extensions also provide you with detailed reporting on the calls you receive from your ads. You may also track phone calls as conversions if phone calls exceed a specified length of time. Sitelinks - lets you show links to specific pages on your website beneath the text of your ads helping customers find what they're looking for on your site with just one click. 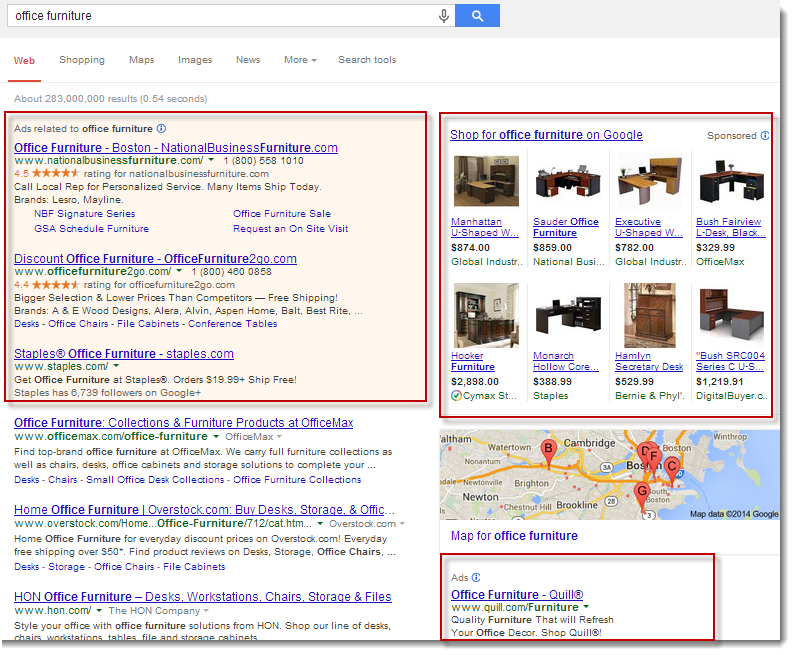 Sitelinks appear in ads at the top and bottom of Google search results. Social Extensions – allows you to show ratings from your Google+ page. Review Extensions - share positive write-ups, awards, or third-party rankings with potential customers in an additional line of text beneath your Google Search ads. Previous Visits - help people using Google Search find their way back to a website they've clicked through to from search results before. The annotations appear just under the link text in your Search ad. Image Extensions - enable you to more accurately convey the body style of a car, the cut of a pair of jeans, or a particular shade of eye shadow, making your ads richer and more informative so they stand out in a crowded marketplace. Note, these will only appear if you’re ad is in the top spot (still in beta). Looking for more ways to transform your PPC campaigns into traffic generation machines? Click here to download our free, PPC eBook today.